Anybody who has ever written a business plan knows that carrying out a SWOT analysis is a standard part of the process. Whether your purpose is to build your personal brand, start a new business or take stock of where you are with your current one, a SWOT analysis looks at the strengths, weaknesses, opportunities and threats of a given project. The results of a SWOT analysis can guide you when it comes to carving your niche, defining your brand, modifying your business model, identifying your target audience and refining your strategy. It’s a straightforward analysis too, something you can quickly do yourself, and its simplicity makes it a great little tool to clarify the status quo before committing to big decisions. A SWOT analysis covers internal and external factors that impact your business. Internal factors are entirely dependant on you; you can do something about them. External factors are outside of your immediate circle of influence. You can’t change them, but you need to be aware of them. Let’s look at them in detail. The first part of a SWOT analysis looks at the plus and minuses of you, your team or your project. Your strengths and weaknesses can be many and incredibly varied. They may include the skills, experience, specialisms, networks, assets and talents of yourself or your team members. What sets your business apart from the competition? Ironically, it can be difficult to pinpoint what we excel at. We are often blind to some of our strengths because we tend not to value what comes easily to us. That’s why it can be handy to recruit a friend, colleague or coach to use as a sounding board when you do this exercise. After you’ve identified your strengths, have a look at your weaknesses. You want to determine what you’re not so good at. Then, assess if it’s something you can live with or whether it has the potential to derail your plans. If that’s the case, you will need to do something about it. The purpose of this first half of the SWOT analysis is to make sure that you’re leveraging the strengths and minimising the weaknesses of whatever it is you’re doing. Here, you want to identify external factors that can favour or hinder your plans. They will refer to events that you have little no control over. Typically, they involve market conditions, the political and economic context, the legal framework, the state of society and technology. Typically, opportunities will unveil gaps in the marketplace, key trends that can benefit your business idea and even potential new markets for your products or services. Threats, on the other hand, will identify external factors that can be harmful to your business, either now or in the future. 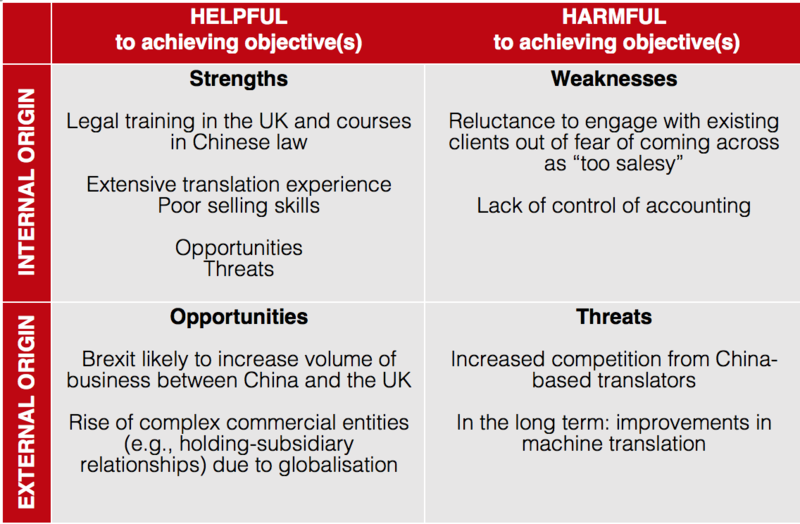 In this second half of the SWOt analysis, you want to ensure you are making the most of the opportunities available out there. At the same time, you want to keep your eyes peeled for any threats to your project. As you can see, a SWOT analysis is reasonably straightforward, and it gives a neat snapshot of where we are at the moment and what to keep an eye out for the future. It helps pinpoint where things can go wrong – or have the potential to superpower your business. It can also be instrumental when analysing your competitors and establishing the differentiating elements to compete in your market. Once you have your SWOT in place, you can also go into a more in-depth analysis of your business strategy with a TOWS analysis. Posted in marketing analysis. Tagged freelancer marketing, strategy, SWOT.